Getting married is one of the most serious and joyful decisions we make in life. As well as being a big commitment and source of happiness for the couple, it has an impact on family, friends and the whole of society. Here you can find out all about getting married at St John’s or having a wedding blessing. We would like your service in church to be personal, meaningful, spiritual and beautiful. A church is so much more than simply a venue for your wedding. Unique and special things become part of your marriage, on the day itself and beyond. A church wedding will add a spiritual dimension to your marriage. The ceremony includes God and looks to him for help and guidance. God’s blessing is the main attraction for many couples, whatever their beliefs.You make moving and powerful vows, or promises, in church. You can only make vows this big in a church. These vows, made in public, will help you to stay together and grow together. God and your church are there for you to help you keep your vows. The Vicar has a very particular role to play in your wedding. They can blend ancient tradition and modern experience to reflect your story. Because of the relationship with the Vicar, your wedding can be made personal, memorable, meaningful and beautiful. Together with the Vicar you will be involved in making choices about your ceremony. St John’s has stood at the centre of Burgess Hill for over 150 years. Imagine all the couples who have married here, some of whom may well be your family. You can feel you’re becoming part of history itself, the bigger plan, by marrying in the same place as your relatives and neighbours. We know these sorts of connections can make your day even more special. For some people, a church simply seems like the proper place to get married. Churches can be described as ‘peaceful’, ‘serene’, or having an atmosphere that makes marrying there a particularly special experience. And after your wedding, you’ll realise that a church is more than simply a wedding venue. Whether you are looking to be married at St John’s or you are looking for a blessing after a civil ceremony – we’ll always be here for you. If you would like to complete an application to the Parish Office for a Wedding booking please feel free to complete the application form below, and you will be contacted by the Parish administrator once this is received. 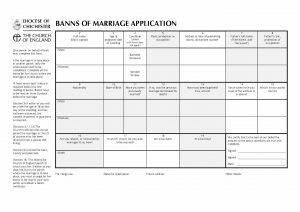 If you are getting married in a different Church, but are a resident of St Johns Parish you will need to get your wedding banns read here. For Reading of Banns, please download the following application form. This will need to be completed and returned to the Parish Office, along with Photocopies of your passports. Once this information is received the Banns will be scheduled and you will be advised when they will be read. The Parish Office is open on Monday to Friday between 9.30am to 12.30pm 01444 230499 or email stjohnsbh.admin@icloud.com.